Ok. Before I share this recipe, I feel like I have to come clean. I have to admit, as much as I love making everything from scratch, sometimes i'm just too tired (whew, that was hard). This week has been particularly hectic at work and when I come home, it's more of a race to the couch than to the kitchen. 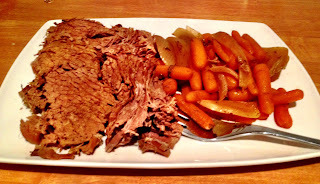 I know some of you must feel my pain, so when that time comes, here is my easiest-ever crock-pot pot-roast. With the help of store-bought mashed potatoes (in the refrigerator section, not a box- no thanks! ), and a brown gravy packet mix, this was literally the easiest dinner i've made in weeks. I think the key, when you're too exhausted to cook, is knowing where to take help from the grocery store, and where to avoid it. * Brown gravy mix and mashed potatoes, if you're as exhausted as me! In a crockpot, place carrots in a layer on the bottom of the pan, followed by onions, and topped with the beef. Pour beef broth and worcestershire over beef, then season liberally with salt and pepper (I do this the night before so I just have to transfer it to the slow cooker and plug it in the next morning). Cook on low heat for 8-10 hours. Serve with mashed potatoes and gravy. Enjoy!